April 15 was tax day on a Sunday, but the monthly Greater Atlanta Coin Show still enjoyed a full bourse of coin dealers and many visitors throughout the day. And, what a beautiful spring day for a coin show. The morning started with overcast skies, but as the day progressed, the temperatures rose and the sun shone in clear blue skies. Here's a big "Welcome and we're glad you came" to the many new visitors to the coin show this month. They visited, they observed, they asked questions and they learned. That's part of the beauty of numismatics - sharing and learning. Of course, another beauty of a coin show is the searching for and finding those treasures to fit into a collection. On the other hand, a coin show also offers a variety of dealers who buy numismatic collectibles along with gold and silver at current prices. Speaking of gold, one somewhat frequent visitor to the coin show shared a story of his recent gold party. This wasn't one of those neighborhood gold parties that you hear about in advertisements - bring your gold to the party and someone will buy it. Instead, this was a Dahlonega gold party. Each attendee had to own an 1861 Dahlonega gold half eagle. If you're not familiar with Dahlonega gold, that's one of the key coins - read most difficult, most coveted of the Dahlonega gold collection. Now, at less than 1600 minted and no telling how many lost or severely damaged through the years, that gold party included an elite group of collectors. In all likelihood, they enjoyed discussing their other Dahlonega gold pieces during the party as well. Years ago, several coin dealers at each coin show would have more than just a few Dahlonega gold coins for sale. Now, Dahlonega gold pieces have become more difficult to find. Most collectors of the finer Dahlonega gold specimens are holding and protecting their valuable collections. On a different, but related note, let's move over 100 years forward in time to 1970 and another mint product with just over 2000 minted. Actually, they estimated 2200 of these sets entered distribution. 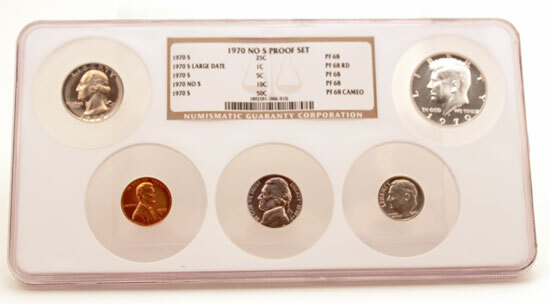 Certified by NGC, this is a 1970 No-S Proof Set with the no-S dime specified as PF 68. With so many coin dealers in one room, each coin dealer offers his best competitive rates for those treasures that interest him. For example, one gentleman brought a collection that had just been appraised somewhere else. Based on the type of valuables, he was directed to four different dealers around the bourse who would be the most interested. Those four dealers provided four different, yet relatively close, appraisals for his collection. As a result, he did choose to sell to the coin dealer with the highest of the four offers. The coin show also has a few dealers who buy bullion silver and gold. Another gentleman brought proof gold coins to one of the bullion dealers. 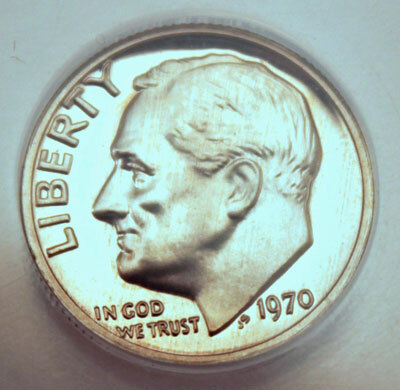 The "correct" proof dime for 1970 includes an S just above the date's "70" and just below the neck line. With its mint mark missing, this set became valuable as one of the US Mint's error proof sets. The 1970 No S Proof Set is just one example of the interesting treasures on the bourse. The coin dealers brought a variety of numismatics and collecting supplies to the monthly coin show - too numerous to mention. By the way, in this 25th year of our monthly coin shows, we are counting up to the 300th coin show in December. Our April coin show was number 292. It's serendipity that the 300th show will occur in the 12th month of the 25th year. Why, when 12 multiplied by 25 equals 300? Well, the early coin show years enjoyed 13 shows per year. While in a few years, the coin show missed a month here and there - once when a fire closed the venue and another when the hotel's ballroom renovation took longer than expected. Looking through the coin show's fliers for 25 years and counting the number of shows, that milestone does occur this year. We will celebrate the 300th coin show in December. Stay tuned to find out how. Prepare to take action at the May Greater Atlanta Coin Show on Sunday, May 20, 2012. This date happens to be the third Sunday in the month, but we learned years ago not to schedule a coin show on Mother's Day.